Derry City manager, Declan Devine will run his eye over two new trialists this week. 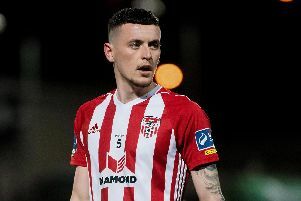 DERRY CITY boss, Declan Devine will run his eye over two new trialists during the club's double-header of friendlies against Drogheda United and Finn Harps this week. Former Falkirk winger, Mark Russell (22) and French-Guinean striker, Mamadou Guirassy (23) have been training with the Candy Stripes and will take part in both friendly fixtures. The versatile Russell, who made over 100 appearances for Scottish Championship club, Greenock Morton, was released by Falkirk earlier this month and Devine is keen to see what he has to offer over the coming days. "Mark Russell is a young lad who was at Falkirk and Morton," explained Devine. "He's in at the minute and Mark can play left-back, left midfield or left of a front three. He can also play central midfield so, again, it gives us an opportunity to have a look at Mark and for Mark to have a look at us. "We also have Mamadou Guirassy who is coming in from France today," added the City boss. "He's a centre forward, a willing runner in behind and a tall, strong lad. So he, again, will take part in the game on Tuesday and we're looking forward to seeing these guys play. "We have to make sure we do our homework properly on all these players. It's another two bodies coming in but more importantly we're always on the look-out for players and hope to add to the squad as quickly as possible. “We’re still working on adding to the squad and will hopefully see some progress on that score in the near future." Devine takes his troops to Drogheda on Tuesday night for a game against Tim Clancy’s side before welcoming Finn Harps to the Ryan McBride Brandywell Stadium on Friday. The Candy Stripes will then head to the Isle of Man next Monday for a short training camp which ends on Wednesday night with a game against the hosts’ national team in Douglas. "We have Drogheda away and Tim Clancy has been very accommodating for us. It will be a good test because they're a good side and it's always been a tough venue to go and play. It's two games in a week, so we will rotate the squad and give people game time, but more importantly it's still preparation for February 15th."